The final weekend of the 2009 Matariki Festival at Te Papa is by no means the least with the return of the popular Kaumātua Kapa Haka, proudly supported by TelstraClear and NZ Post. Kuia from South Taranaki performing the poi at Te Papa (2008). © Te Papa. 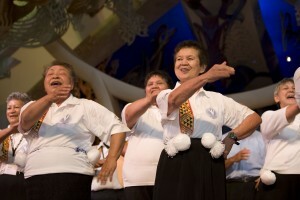 These senior performing artists performed at last year’s Matariki Festival and this year they are going global! Can’t make it to Te Papa? Get your family and friends together and watch the webcast streaming this special event into your home! You can even join in a chat session with others watching the webcast. Join us on Saturday 11 July from 10.30am – 3.30pm and 10am – 3pm on Sunday 12. For the latest info on the Matariki Festival at Te Papa, join us on Facebook or follow us on Twitter!